(StatePoint) Easter is the perfect occasion to enjoy a glass of wine and share a meal with family and friends. 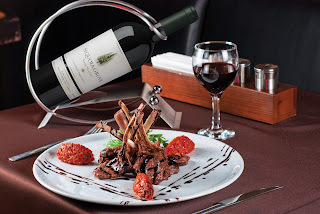 If you are looking for a delicious wine pairing this holiday, consider a classic red variety like Cabernet Sauvignon. Bold and spicy with luscious black fruits and a full body, Cabernet Sauvignon is a perfect choice for your Easter meal. In particular, Cabernet Sauvignons from the Rutherford section of Napa Valley are known for their exquisite power, balance, and concentration of fruit. They pair beautifully with all manner of foods. • Prepare the chops, eliminating any excess fat and beat with a meat tenderizer. Lay the chops in a pan, salt and pepper to taste on both sides. Drizzle with olive oil, squeeze of lemon and flavor with chopped garlic and fresh rosemary. Cover and refrigerate for 30 minutes to allow the chops to marinate. • Heat a cast iron plate and cook the chops over a flame for around four minutes on each side. When cooked, serve piping hot with side dishes and a glass of Sequoia Grove Cabernet Sauvignon. Celebrate Easter with elegance by inviting family and friends to share this delicious food and wine pairing. No Comment to " Lamb Chops and Red Wine - A Perfect Easter Pairing "